In 2016, Mura Masa, whose real name is Alex Crossan, was a "bedroom producer" uploading tracks to Soundcloud from his hometown in Guernsey, one of the Channel Islands off the coast of Normandy. Fast forward to 2017 and he is a Coachella headliner performing his nimble, globally-influenced beats with collaborators (and friends) like ASAP Rocky, Charli XCX, Desiigner, Bonzai, and Tom Tripp, to name a few. Mura Masa's electric show, which he modestly describes as "a kind of weird one-man band," will travel to Union Transfer here in Philadelphia, on Saturday, August 18th. Currently, in 2018, the 22-year-old artist has been on tour for about a year, since his self-titled album dropped in July of 2017. In some ways, he hasn't changed: he still produces most of his music on his laptop. This is more flexible, he explained, allowing him to get to work as soon as inspiration strikes. He also has continued to collaborate with friends– his latest single, "Complicated," features Nao, whose funky, warbling vocals were also featured on a 2017 and a 2015 version of the song, "Firefly," and he has continued to collaborate with Bonzai (now known as Cosha), a good friend and former touring partner with a mellifluous alto voice. Many aspects of his life are different, however: he moved to London, where street music has had a heavy influence on his recent work (a steel drum riff makes a star appearance in his best-known song, "Love$ick feat. ASAP Rocky"). He has also been featured in publications like the New York Times and Complex. Translation: he is both recognized as an established artist and embraced by youth culture, an auspicious combination. "I think the idea of electronic music is a DJ playing out music with his hands in the air, with a bunch of kids, possibly on drugs, sort of flailing around. But I think my show has nothing to do with that kind of culture," he said. A self-taught artist from a musical family, he proudly credits most of the instrumentation featured in his music to himself. How does this translate to a live show? "I'll just play the most interesting thing that's happening in that song at any one moment," he said, whether it be "really interesting trumpet," or dreamy guitar, or buoyant synths, or any of the other "instruments you might find in a band," which is how he categorized the stage-filling variety of instruments he plays. Expect a mash-up of a dance party and a hip-hop show, but with instruments rather than a laptop as the show's centerpiece. 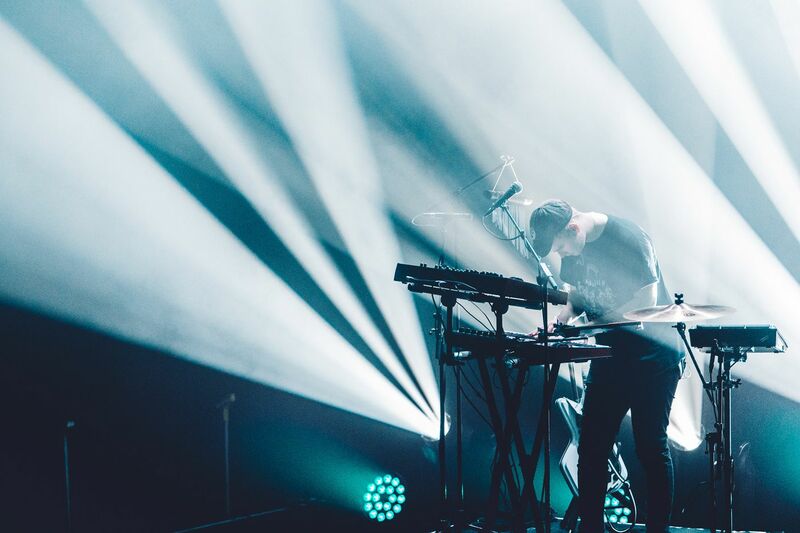 As with his live performances, Mura Masa's musical persona cannot be contained in a single box. He had trouble pinpointing why he is different from his electronic counterparts, saying that, "the only way I can make music is the way I know how." However, he eventually disclosed, "I don't really feel beholden to anyone…I'm just kind of trying to express myself." Herein lies a major difference between him and his contemporaries, considering that most artists with his degree of commercial success are preoccupied with pandering to pop culture: endorsing products in music videos, appearing in tabloids, you know the drill. Mura Masa takes a different approach, engaging directly with his audience on social media by answering questions and retweeting followers. Perhaps Mura Masa's introspective and noncommercial nature takes root in his unusual childhood. He grew up playing in a punk band with his parents, on an island with a population of 63,000. "The music scene there is kind of compromised," he said, listing "pockets" of folk, punk, and an emerging electronic scene on Guernsey. "Any place that's kind of isolated like that, people are drawn to extreme forms, that's why you get so much metal music from Norway and Finland, those sort of remote, barren places." He explained that he likes music with a strong message, from punk to his mom's Joni Mitchell records, to the Gorillaz album Demon Days, all of which he lists as early influences. One certainly doesn't have to listen hard to hear Gorillaz' electro-hip-hop-grunge sound in Mura Masa's slightly poppier beats. When asked what some of his biggest inspirations are today, his replies were as surprising as ever. He said that he enjoys how film scores tell a story, and half-joked that he listens to them "alone, with headphones, looking out the window, crying,". He also described how he takes a lesson from the fashion industry: "the idea of art as a practical object– clothing is sort of a practical thing we've invented to keep ourselves warm, but also… it can be artistic and expressive,". The young Brit comes to Philadelphia to promote his latest album, which he describes as "a more full body of work," but he also said that his show would feature new, unreleased music. Ever humble, he added, "I'm hoping that people just come ready to hear music performed live and have an amazing night,".